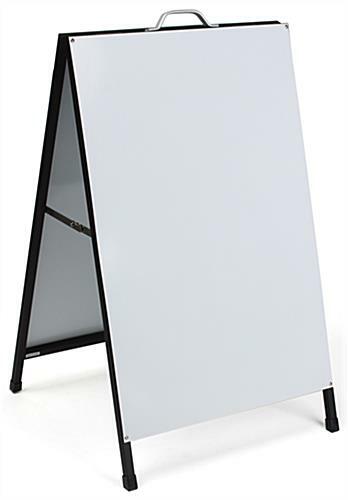 This A-Board Features Two-Sided White Steel Boards. Browse Through The Online Catalog for More Options! Order This A-Board by 1pm EST (M-F) to Received Fast Shipping! (2) White, glossy steel panels for vinyl lettering or UV full-color prints (printing not included). 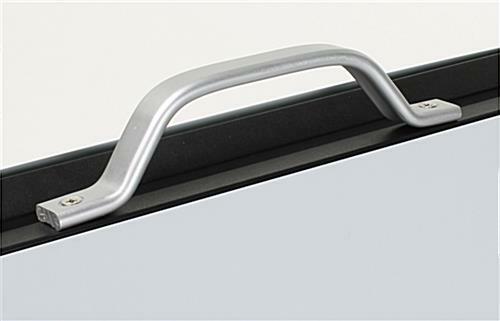 Metal hinges allow the a-frame to fold flat when being carried by the handle. Heavy-duty, steel frame construction adds stability. This a-board is a perfect way to publicize alluring messages. Each unit features two 23-1/2"w x 35-3/8"h glossy white steel panels for vinyl or UV printed graphics. 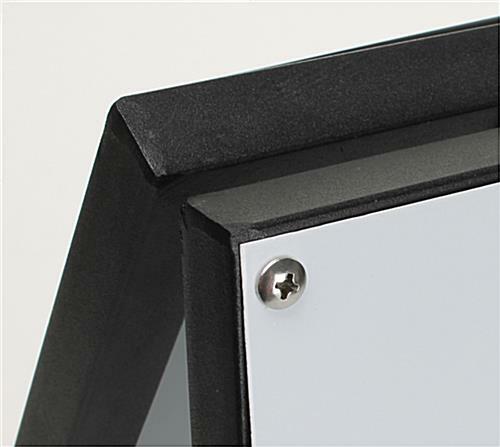 Simply loosen the screws securing each substrate on the frame, and take the panel to your local print shop to have imprinted with customized text or logos. This outdoor a-board that has two steel panels enables users to display advertisements back-to-back, as the frame is double-sided. Both steel sign substrates have a glossy white finish that will make custom advertisements pop out at your target market. 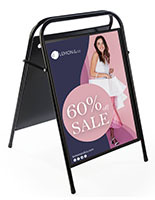 This a-frame display, a-board is constructed with a robust steel frame, making it durable for many years of use. 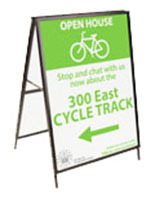 Unlike other sidewalk signs, this unit has panels bolted directly to the frame. This results in a unique deisgn, which differentiates it from other a-frames. 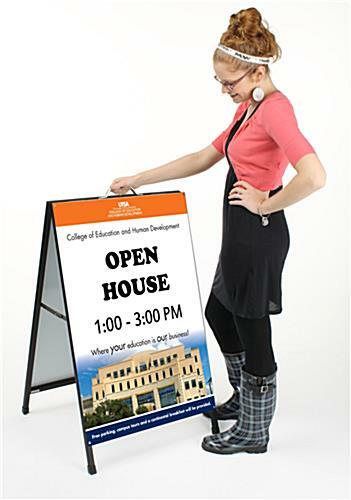 This heavy-duty a-board, also called a sidewalk sign, can be used indoors or outdoors. The double-sided design helps to attract both walk-by and drive-by customers coming from either direction. 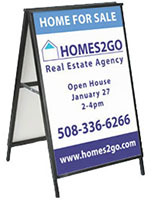 This sidewalk sign, a-board that is double-sided, is sure to command attention no matter where it is placed. This a-frame display that is two-sided enables advertisers to use both sides to create their custom messages. Passersby's coming from both directions will be able to view the message on the board. An a-frame display is a very effective way to gain the attention of your customers. Graphics are not included with the unit. However customers can create their own signage and have your local sign shop add vinyl graphics and lettering. Remove the glossy panels from the a-frame and bring them to a graphic shop to have vinyl lettering or full color graphic applies. Once your advertisement is completed, remove the film form the VHB tape on the frame, attach the board and then tighten all four screws. 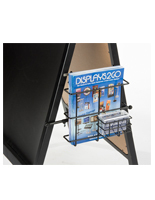 This sidewalk sign also comes with a hinged top that enables users to easily fold these units flat for easy storage and mobility. 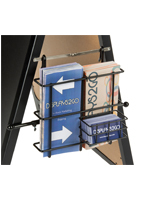 The foldable sign can be easily transported from one location to another. 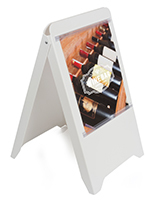 This a-frame board is available in many other sizes and colors as well. 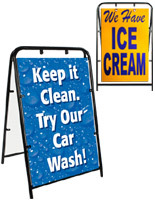 Get your message out with this sidewalk sign to draw in more potential customers! Please Note: If used, dry erase pens or liquid chalk markers will leave ghosting on the board. 18.0" x 39.8" x 24.5"